The Humboldt Redwoods Interpretive Association (HRIA) is a 501(c) non-profit, providing volunteer-run Visitor Centers at four State Parks in Humboldt County. We hope that you will stop by to get information about hikes, directions, ecology, history, as well as maps, brochures, books, and souvenirs. We strive to connect visitors and the community to the incredible redwood forest, in hopes of spreading appreciation and a passion for the conservation of the tallest trees in the world. California's 3rd largest state park, with over 53,000 acres, and the largest old growth contiguous redwood forest in the world! 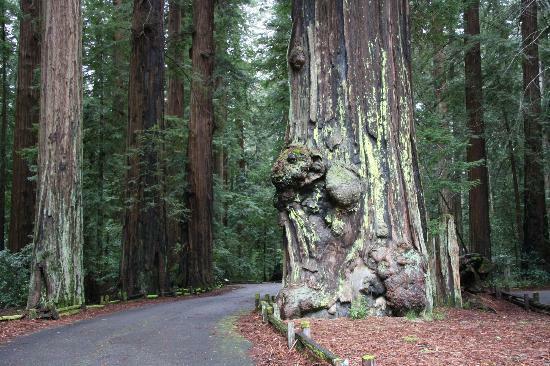 Drive along the 32 mile Avenue of the Giants to explore Humboldt Redwoods State Park, and come by the Visitor Center between 10:00-4:00 between the towns of Weott and Myers Flat. For more specific information about the parks, call us at (707) 946-2263. Come explore one of the first redwood parks - with 1,800 acres, campgrounds, trails, and the Eel River, theres lots to enjoy! 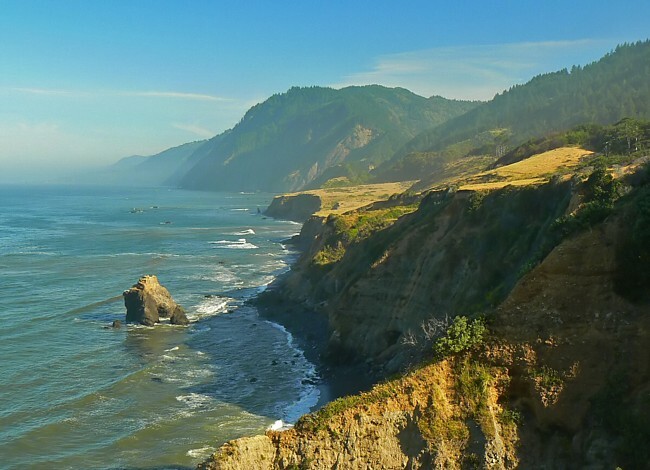 Located along Highway 101, 200 miles north of San Francisco. Campground open year round, and the newly remodeled Visitor Center opening this upcoming summer! For more specific information about the parks, call us at (707) 247-3318. This state park gem is tucked away on Highway 36, nestled in the redwoods and next to the Van Duzen River. Campground and Visitor Center open all year, with Junior Ranger and campfire programs during the summers! For more specific information about the parks, call us at (707) 777-3683. Located along the Eel River in northern California, Humboldt Redwoods State Park contains some of the world's most majestic ancient redwood groves. The park encompasses over 53,000 acres, including 17,000 acres of old-growth coast redwoods. In 1921 Save the Redwoods League dedicated the first Memorial Grove, Colonel Raynal C. Bolling Memorial Grove, in what is now known as Humboldt Redwoods State Park. Today the park contains a diverse coast redwood ecosystem, which includes Rockefeller Forest, the largest remaining old-growth forest in the world, and the entire Bull Creek watershed. With more than 250 camp sites, 100 miles of hiking, biking, and riding trails, and the scenic 32-mile Avenue of the Giants, Humboldt Redwoods State Park offers something for everyone. Whether you have just a single day to visit or a week long vacation to explore, a journey into the redwood forest is sure to be an awe-inspiring experience. The park is open year 'round and recreational activities are available throughout the four seasons. 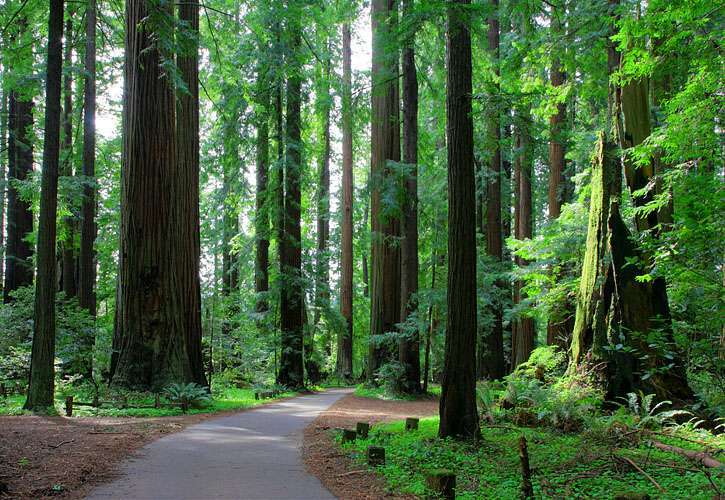 Get ready for your visit to Humboldt Redwoods State Park with our interactive app! Download the Discover Nature App - Humboldt Redwoods for fun games, maps, trail locations and descriptions, and photo sharing. Go to your app store to search and download "Discover Nature" - open app and allow it to access your location (so you can see where you are in the park) and to receive notifications (for virtual signage) - select destination "Discover Humboldt Redwoods" and tap to download our location. You can use Discover Nature App at many parks and recreational areas across the country! Once downloaded, you can use the app without cell service or an internet connection. We are looking for well-rounded volunteers to join our staff, working either in campgrounds as Camphosts or in the Visitor Center. Please call us at (707) 946-2263 if you are interested. 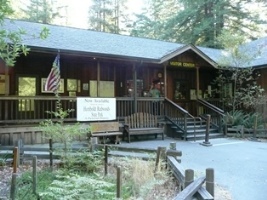 The Humboldt Redwoods Interpretive Association (HRIA) is an educational non-profit group working in cooperation with the California State Parks at Humboldt Redwoods State Park, Richardson Grove State Park, Grizzly Creek Redwoods State Park, Benbow State Recreation Area and Sinkyone Wilderness State Park within the North Coast Redwoods District, Eel River Sector. The mission of HRIA is to provide visitors with stimulating explanatory information on the natural and cultural history; to help visitors see these parks not only with their eyes, but also with their hearts. We lead others from mere observation to insure in them a sense of awe in which the human spirit finds meaning, wisdom, and a connection with all living things.